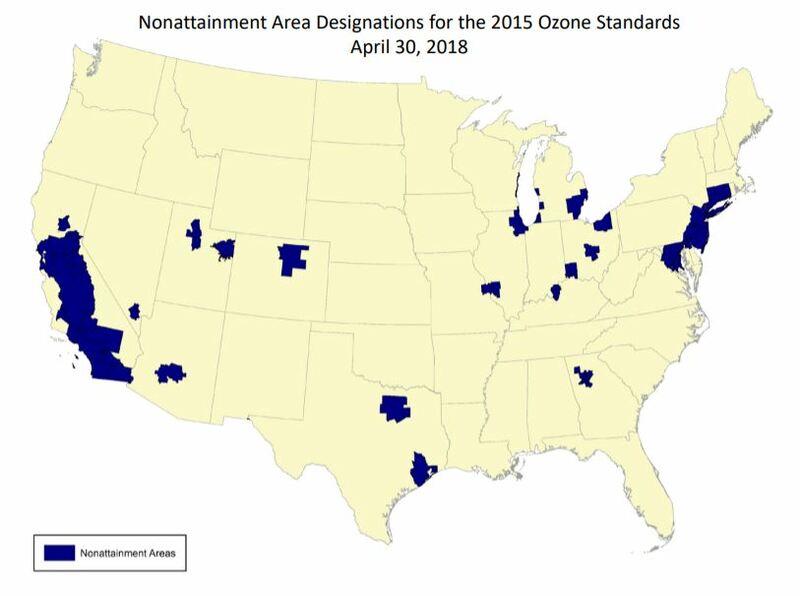 EPA designates 2015 70 ppb Ozone NAAQS non-attainment areas. On March 12, 2018 the U.S. District Court for Northern California ordered the Environmental Protection Agency to move ahead to carry out the 2015 Ozone Standards and designate areas in the country that do not meet the new level. The court gave EPA an April 30th deadline to comply (see April 2018 Emissions Monitor). 70 ppb Ozone Nonattainment Areas. The 2015 standard lowered the national ambient air quality standard (NAAQS) for ozone – a criteria pollutant – from 75 to 70 parts per billion (ppb). After designating most of the US. 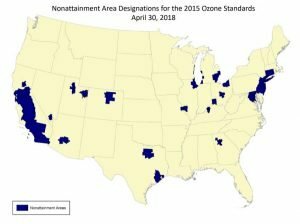 as meeting the standards in November 2017, on April 30, 2018 the EPA published Additional Designations for the 2015 Ozone Standards on its Web site. A majority of the nonattainment designations outside of California specify that the areas are in marginal nonattainment. These areas are not required to submit state plans demonstrating how they will attain the standards. 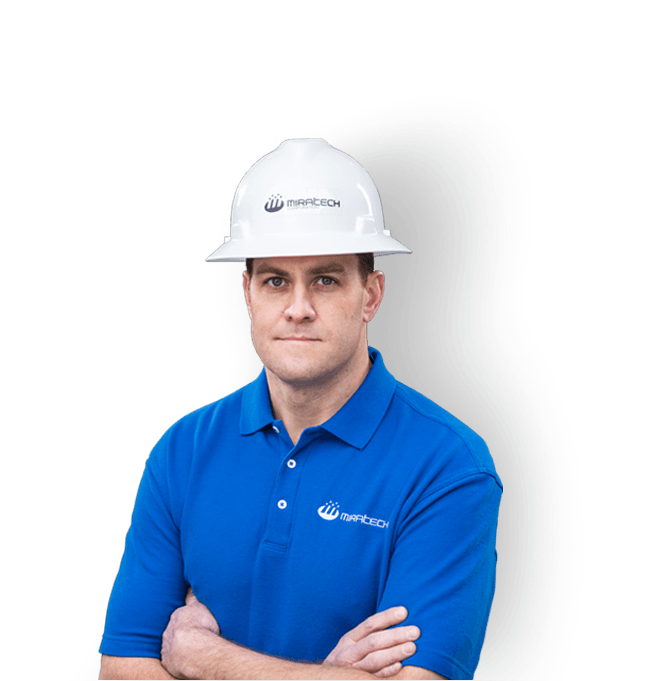 Nevertheless, all nonattainment areas are required to attain the standards, with different time periods allowed for compliance depending on the severity of the designation. All nonattainment areas are also potentially subject to development restrictions. Only in California were there designations of serious, severe or extreme nonattainment. Attainment/unclassifiable – meeting the standard and not contributing to a violation of the standard (all remaining areas addressed in this final rule). The table at the end of this fact sheet provides details for each area. EPA’s final rule does not designate eight counties in the San Antonio, Texas area which will be designated by July 17, 2018. PUBLIC NOTICE: Additional Air Quality Designations for the 2015 Ozone National Ambient Air Quality Standards. FACT SHEET: Additional Designations for the 2015 Ozone National Ambient Air Quality Standards. RESPONSE TO COMMENTS: Additional Air Quality Designations for the 2015 Ozone National Ambient Air Quality Standards. EPA has designated 51 areas in 22 states, the District of Columbia and two tribal areas as not meeting the 2015 70 ppm ozone standard. Eight San Antonio, Texas areas have yet to be designated. Contact MIRATECH for help controlling NOx, VOC and CO emissions in stationary engines.